Guys, isn't capital punishment hilarious? I mean, there's nothing funnier than the state putting someone to death for a crime they're pretty sure they committed even though there's always a margin of error and it's 100% certain that innocent people have been executed! LOL! 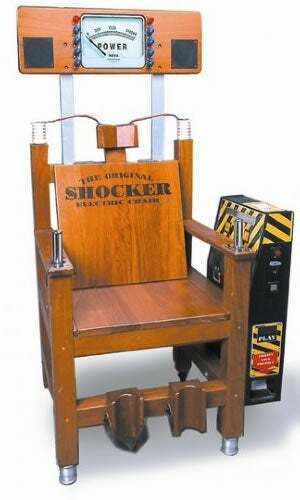 For my next party, I'm getting the Shocker Chair, the only fake electric chair worth its weight! Experience the gruesome Shocker electric chair with 2,000 volts involved. It’s guaranteed to make you tingle. Let your friends see the smoke rise as the voltage is increased.